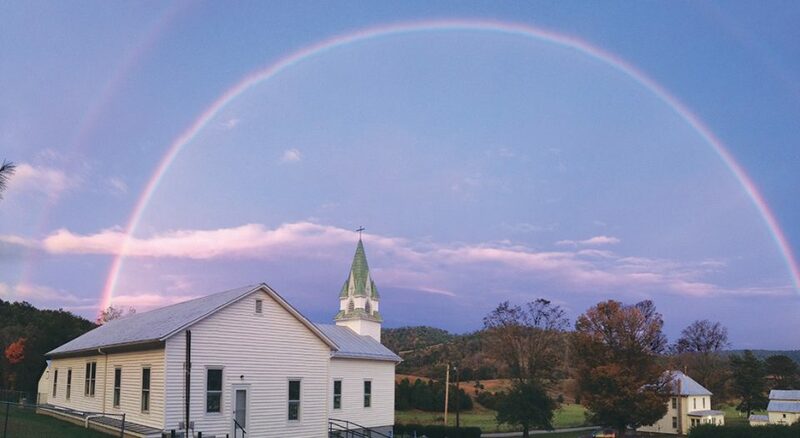 A rainbow frames St. John Lutheran Church in Moyers, which is part of a rural five-point parish in West Virginia. 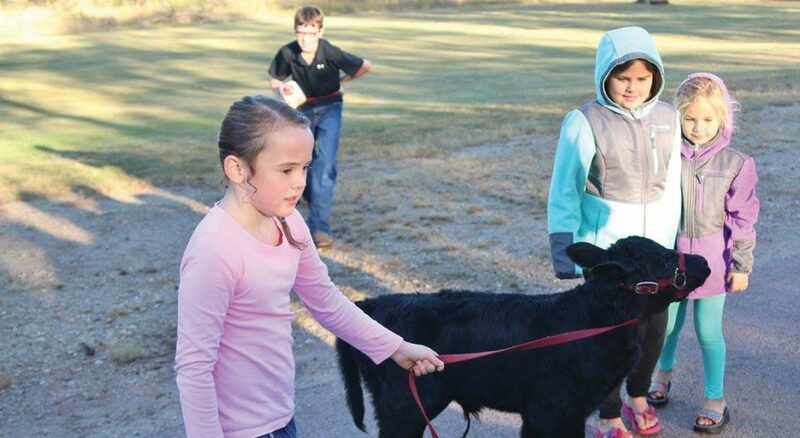 Members of Storla Lutheran Church, Letcher, S.D., brought their animals, including a calf, for a blessing at the church. 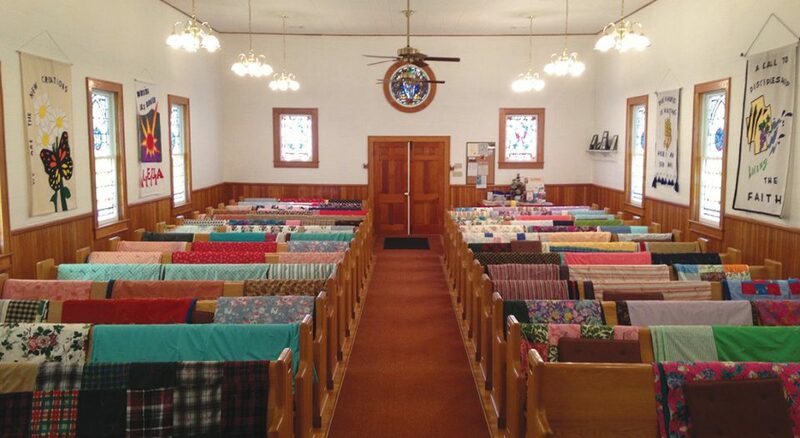 While Mountain Lutheran Parish’s five congregations all have their own building and worship times, they come together to make quilts, which they donate to Lutheran World Relief. 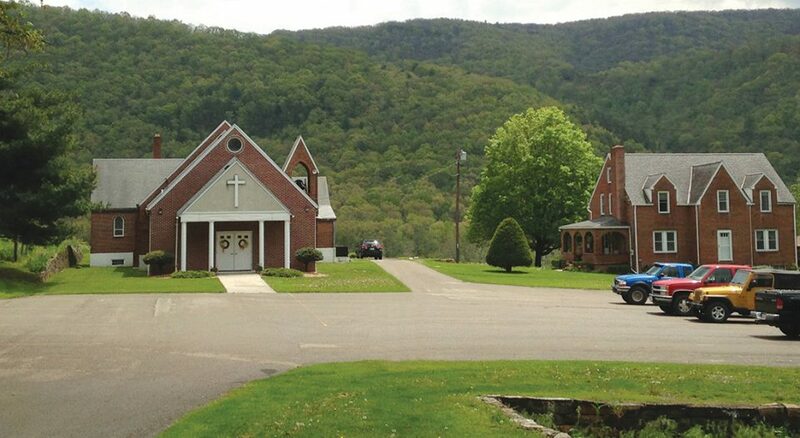 Faith Lutheran, Franklin, W.Va., is part of Mountain Lutheran Parish, five congregations situated in the Allegheny Mountains in the heart of Appalachia. Storla Lutheran’s history dates back to 1882. Today it’s part of a two-point parish with Salem Lutheran in Mount Vernon, S.D. 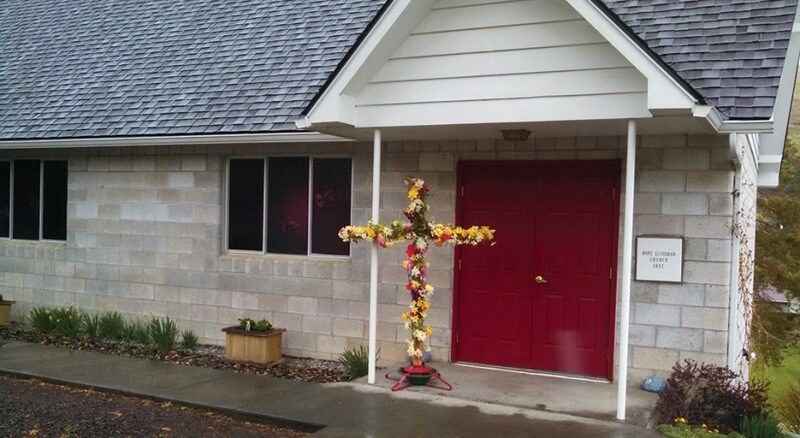 The Easter cross outside Hope Lutheran Church, Heppner, Ore., takes bloom with flowers that members attach in gratitude or memory of a loved one. 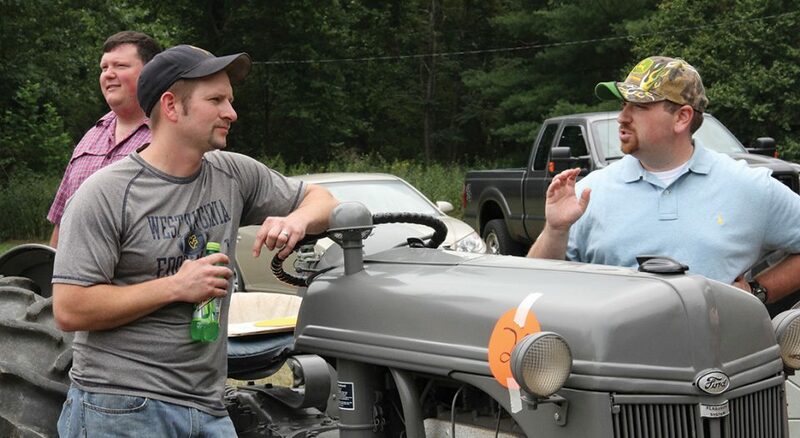 Jason Felici (right) served as a judge in the local tractor parade. The pastor of Mountain Lutheran Parish says a large part of rural ministry is being out in the community. 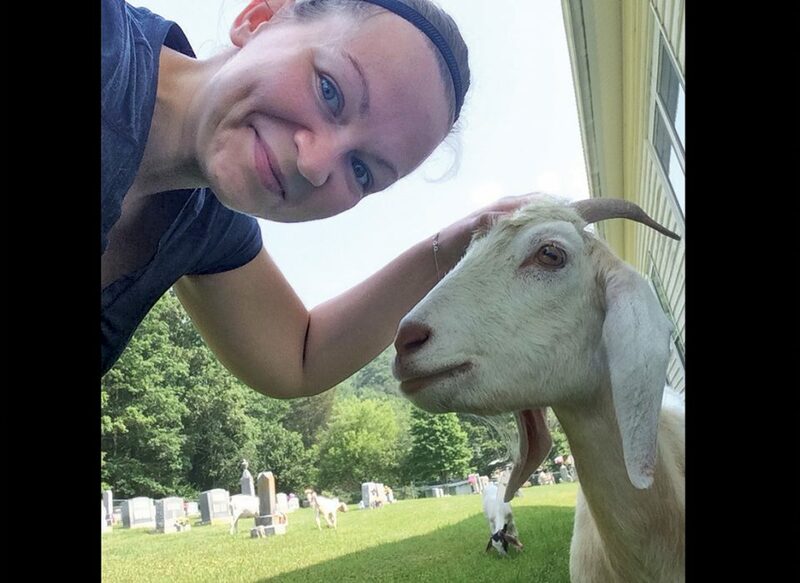 Jess Felici, who serves Mountain Lutheran, says pastors in rural ministry embrace being “comfortable in chaos,” especially when it includes herding goats that got loose on church property. As she was on her way to her first worship service of the morning, Jess Felici, a pastor of Mountain Lutheran Parish, received a phone call from a member saying worship was canceled. Why? It was skunk mating season and the sanctuary fell way to the animals’ unfortunate fumes, making it too smelly to be in the church for worship. After she stopped by the church to attest to the circumstances herself, Felici decided to use the extra time to visit the home of some members. She had planned on sharing a cup of coffee and conversation in their living room, but instead found them all in their chicken house dealing with a rooster feed situation. What Felici thought would be a typical morning worship service turned into coffee in a chicken house picking eggs. “If that doesn’t give a good description of rural ministry!” she said. Felici serves a five-point parish in rural West Virginia, the heart of Appalachia, with her husband, Jason. They spend their time going back and forth between Mount Hope in Upper Tract, Faith in Franklin, St. John in Moyers, Calvary in Brandywine and New Hope in Minnehaha Springs. 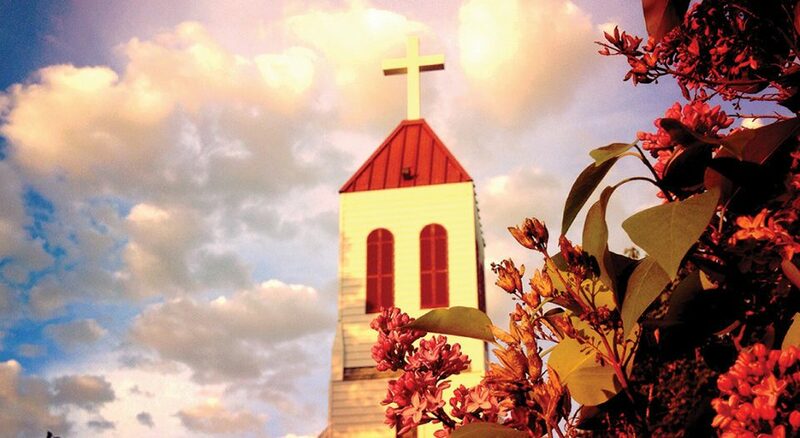 The ELCA has a long history of ministry in rural areas. Rural congregations rank as the highest percentage (28.1) of ELCA churches compared to other population demographic segments. Alvin Luedke is a professor of rural ministry at Luther Seminary in St. Paul, Minn., who has served as a pastor in a rural setting. He’s witnessed the changes occurring in rural America over the past few decades, and while rural congregations are still the majority of ELCA churches, he says they’ve been affected by challenges brought on by this changing context. “We have some congregations that are in very economically distressed regions—the towns are declining,” he said. “Some of our agricultural areas are declining because of consolidation of farms and becoming more commercialized. These changes have resulted in some people, most notably the younger generations, leaving their rural homes to find work in more metropolitan areas. This has led to an aging and declining population in rural America, which is reflected in ELCA congregations. These changing demographics can present challenges related to various aspects of the congregation’s life, but the most articulated concern is finding and keeping a pastor. Members worry that their town won’t be appealing to a new pastor or could cause challenges for someone whose spouse might not be able to find work in the community. Despite the challenges of rural population decline, there is a lot of vitality in rural congregations, said Bill Tesch, the South Dakota Synod’s director for evangelical mission. “Congregations that are thriving are those that have decided to see these changes not as a catastrophe but as something God is up to,” he said. “There are still gifts that God has given that are to be used for the sake of ministry. Congregations are recognizing and celebrating that, even if they are almost all a little smaller than they were 30 years ago. In most cases, Tesch said, the rural congregations he considers to have the most vitality are those that have entered into a cooperative ministry or multipoint parish, like the ones Eckels and the Felicis serve. Multipoint parishes have become increasingly prevalent over the past couple of decades as an option for congregations that know they can no longer afford their own pastor. Back in West Virginia, Jason Felici said multipoint ministry is something that’s long been distinct of rural ministry in Appalachia. The congregations he and his wife serve became a five-point parish in 2012, but three of them have been together since 1946. Some partnership ministries leverage the ELCA’s relationship with full communion partner churches. 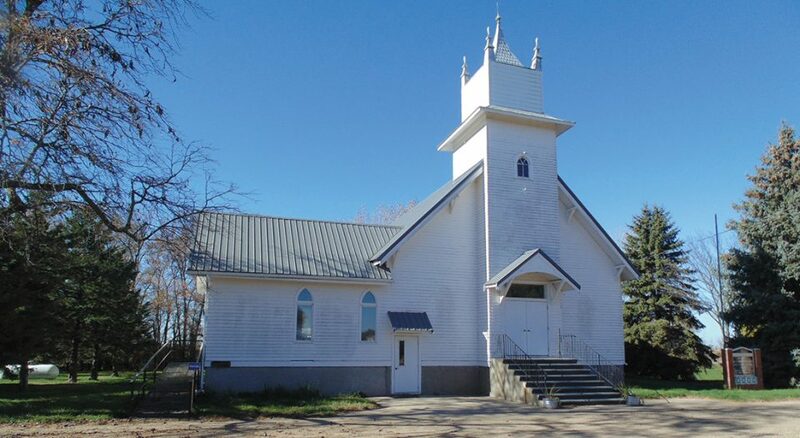 Katy Anderson is pastor of All Saints Episcopal and Hope Lutheran, a cooperative ministry in Heppner, Ore.
Further proof that there is no one answer for rural congregations during these changing times, St. Peter Lutheran in Audubon, Minn., is going its own direction. Established in 1893, St. Peter has been yoked with congregations for most of its history. Before Ruth Hetland was called as pastor two years ago, the congregation decided to take a “leap of faith” and call their own pastor. Lay leaders can be particularly needed in rural congregations. Multipoint parishes turn to lay leaders to fill roles that a pastor serving one congregation might otherwise do. The trend in aging rural populations can have an impact on church lay leadership roles too. At St. Peter, Hetland said finding someone to usher or help with Sunday school can get a little tricky after October as many of the congregation’s older members move south for the winter. While rural areas might be shrinking in population, they aren’t lacking in community—and church is often at the center. This sense of community also means pastoral care might look a little different from a suburban or urban context. For the most part, it takes place out in the community. Luedke said he tries to make seminary students, who currently mostly come from urban and suburban backgrounds, aware of these nuances of rural life. While rural congregations might be in isolated parts of the country geographically, their members feel deeply connected to the wider church and their ministry in the world. Though rural ministries may no longer look like the congregations that originally formed them, those who live in them say the joys far outweigh any challenges. At 28.1 percent, churches in rural settings make up the largest single demographic block among the ELCA’s nearly 10,000 congregations. Every ministry context has its challenges and opportunities, but ministry in rural contexts offers valuable insights into approaches and solutions that can guide congregations in every setting.